Low quality arrows- You need to buy better ones. It is really slow- Don't expect to hunt large game with it. Whether you are an experienced hunter who wants to add a lightweight bow to their arsenal or a novice who is just learning the basics, the Inferno Fury from Arrow Precision might be exactly what you are looking for. It features a sturdy and stable build and is designed to provide exceptional performance, all at a price that will fit almost any budget. This recurve style crossbow kit also includes everything you need to get started. The build of a crossbow will dramatically affect its performance, and it should be carefully considered. While you want it to be sturdy and supportive, you also don’t want the crossbow to be uncomfortably heavy. Weighing slightly over 4.8 pounds, the Inferno Fury is a lightweight crossbow that almost anyone can comfortably handle. The lightweight build ensures that you can comfortably hold and aim the crossbow without experiencing arm fatigue that can throw off the accuracy of your shot. The fiberglass limbs ensures a lightweight build that is also durable, and the aluminum barrel provides a smooth track for the arrow to follow. The rear stock is also constructed from a lightweight composite material, and its ambidextrous design is comfortable for right and left handed archers to grasp. not only affect the appearance of the bow but also its ability to perform. The Inferno Fury from Arrow Precision comes with a functional and efficient design that also looks great, and measures 31 inches making it the ideal length for all types of shooters. 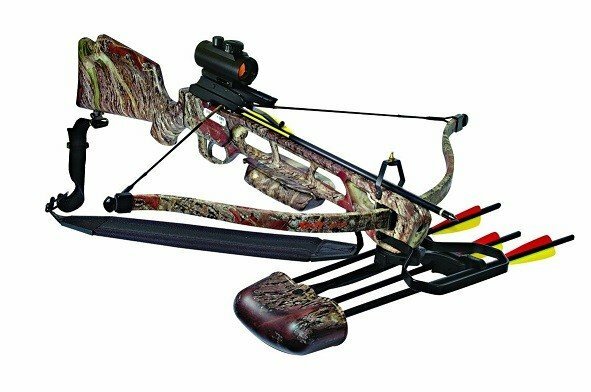 This crossbow features a full traditional camouflage design that allows it to blend seamlessly into the surrounding environment. Not only is this an advantage for hunters who are trying to remain undetected in a blind, it also gives the recurve crossbow a professional and stylish appearance. The crossbow is also designed with your comfort in mind, and includes a padded shoulder strap for added support. It also makes it easier to carry the crossbow when you are hiking to your favorite hunting spot. The stock and automatic safety lever are designed for right and left handed archers, and with a draw weight of 175 pounds and a maximum velocity of 235 feet per second you have all the power and speed you need to take down small and large game. How a bow performs can make a hunting trip fun and successful or leave you frustrated and disappointed. Arrow Precision has created a high performance crossbow that will easily hit stationary and moving targets. The combined fiberglass limbs and aluminum barrel ensure an accurate shot, and with a draw weight of 175 pounds you can easily penetrate most targets. This recurve crossbow also comes with an impressive maximum speed of 235 feet per second, which is easily fast enough to keep up with moving targets. To ensure a smooth and easy draw, you also have the advantage of the convenient cocking device for the rope. While the speed and power will change with the bow’s set up, you can easily use the Inferno Fury to hunt everything from deer and antelope to smaller prey. There are plenty of features included with the Inferno Fury to ensure that it is comfortable and easy to use. The kit from Arrow Precision includes everything a beginner needs to get started, along with a convenient instructional manual that will walk you through the simple set up steps. It features a Weaver style mount for the included red dot scope that is also easy to adjust as needed. The scope will help you line up each shot, so you never have to worry about losing expensive arrows. The shoulder strap is padded for added comfort, which is always appreciated if you have to carry the bow over long distances. There is also a quiver that can be detached for convenience, along with four arrows so you can immediately get started. There is very little not to like about this recurve crossbow that seems like it was designed for everyone. The rear stock and trigger feature an ambidextrous design that is comfortable for right and left handed archers to grasp and fire, and its lightweight construction is perfect for younger shooters. Weighing only 4.84 pounds the bow is comfortable to aim and carry, and you don’t have to worry about arm fatigue that can throw off your aim. The 175 draw weight is easy to pull, and with a maximum speed of 235 feet per second there is very little you can’t hit with this crossbow. Designed for novices and experienced bow hunters, the Inferno Fury is an affordable option for anyone looking for a high quality crossbow.